We love seafood! Of course our very favorite is a quality, fresh bit of fish, and in such cases often times only a very little seasoning will suffice, however, what to do with the economical frozen fillet? 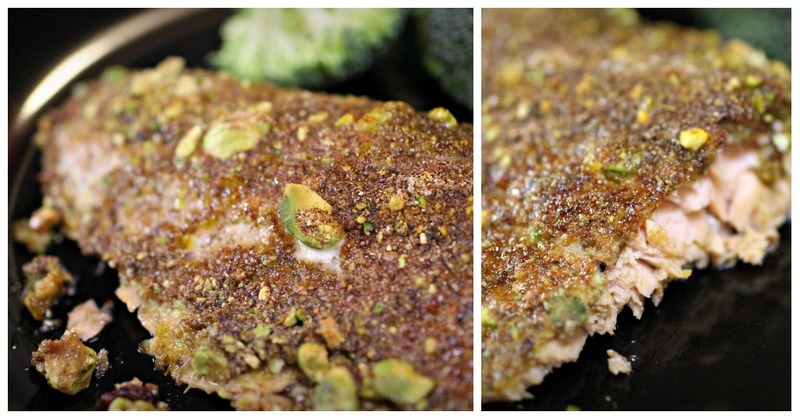 With a little panache the less expensive cut of fish can become a mouth-watering treat. The inspiration? I’ve been haunted by a dish we ate while in Honolulu. It was a lovely cream based lobster entrée that tasted strongly of roasted pistachios. What a great way to celebrate this blessed nut! Maybe I’ll try to recreate that one someday. In approaching this recipe I wanted something quick, healthy, and foolproof. We cook this dish up quite a bit, hope you enjoy! Lay out your salmon in an open ovenproof dish or cookie sheet (by lining dish/sheet with tinfoil you can lessen your clean up). Generously drizzle the fish with olive oil however it doesn’t need to be completely coated. Powder your pistachios in a food processor (some bigger chunks are fine). 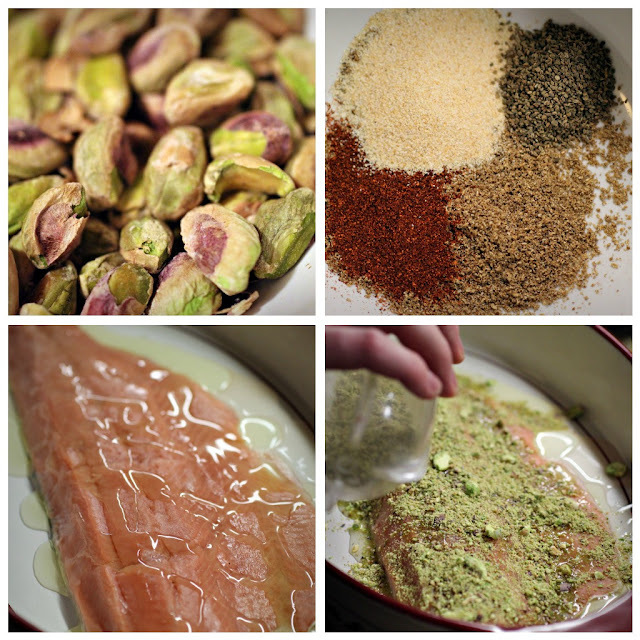 Toss together the rub: ground pistachios, ground coriander, garlic powder, paprika, celery seed. Cover the fish with the rub. Add additional fresh ground white pepper and salt to your personal preference. Bake uncovered at 375 F for approximately 25 minutes. Let me know if you decide to give it a try! You'll be so happy you did! Thanks for following me and for inviting me to follow you. Great blog:) Congrats on the bambino too! Oh! I want to make this for my boyfriend, thanks for the share! You have a great blog! thank you :) of course do I follow you too! I don't even like salmon, but this looks amazing!! wow that's a real compliment than betsy! thank you! just pinned this looks yummy-yummy-thank you for sharing!